The Edale is a 2 bedroom coach house/apartment located in Biggleswade, Bedfordshire. 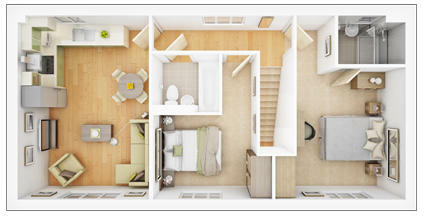 With 2 double bedrooms, the Edale apartment offers a versatile layout to suit individuals, couples or young families. The private entrance hallway leads upstairs to the first floor accommodation, which includes an open plan kitchen/living/dining room, providing ample space for everyday living and socialising. Also located off the landing are a master bedroom with en-suite shower room, a double guest bedroom and a main bathroom. Master Bedroom (min) - 3.84m x 3.77m, 12'7" x 12'5"
Disclaimer - Property reference 204-20793-041_2_51_101368. The information displayed about this property comprises a property advertisement. Rightmove.co.uk makes no warranty as to the accuracy or completeness of the advertisement or any linked or associated information, and Rightmove has no control over the content. This property advertisement does not constitute property particulars. The information is provided and maintained by Taylor Wimpey. Please contact the selling agent or developer directly to obtain any information which may be available under the terms of The Energy Performance of Buildings (Certificates and Inspections) (England and Wales) Regulations 2007 or the Home Report if in relation to a residential property in Scotland.